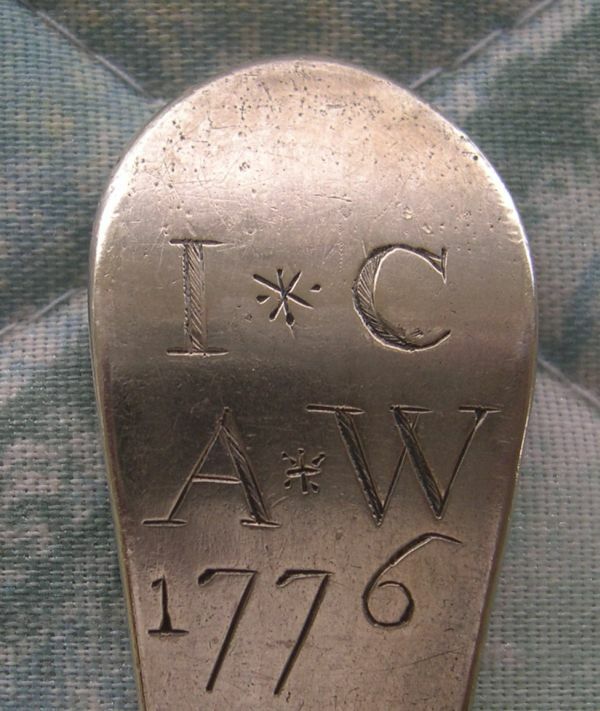 This nice hand made silver server spoon purports to be a Revolutionary War marriage spoon. In this case the engraving of the initials was done at the time the spoon was made. However, look closely at the '1776' date. The style of the date engraving is different and the quality of engraving is not the same. My guess is that the date was engraved at a later time period but I have seen other marriage spoons of that era which also show the date in a different engraving font. During the late Victorian era, families became very conscious of genealogy and many wanted to trace their ancestry back to the early founders of the country. My guess is that the family which owned this spoon determined that these people were married in that year (probaby a family bible or other source). I suspect that the date engraving was done by them. The silversmith is Godfrey Shiving, a Philadelphia silversmith who was active about that time. but now early American colonial silver is much higher valued than similar aged English silver. Of course the year "1776" is very important in US history as the Declaration of Independence was announced on July 4 in Philadelphia. I have not been able to trace these initials as of this time, and would appreciate any help. If it could be shown that these individuals were part of the revolutionary activities, this spoon would become an important part of our country's heritage.